We try to regularly cover remarkable women of motoring, from the eye-patched and dramatic to the decidedly mundane but important, to the terrifyingly bonkers. Today's woman I suppose falls in the mundane and useful category, but there's not a driver alive who hasn't used this woman's brilliant and largely unsung creation: the windshield wiper. Mary Anderson was born in Alabama right after the Civil War; before she turned 30 she was in Fresno, CA running a cattle ranch and vineyard. While I'm sure there's great viniculture and cattle-related stories she has, this isn't Winelopnik or Livestocknik so we're going to leap ahead to a wintry 1903, when Anderson was visiting New York City. It was sleeting out, and she noticed that the driver of a trolley car was operating the vehicle with the front window open because he couldn't see through the window due to the driving rain and sleet. As you can imagine, this was a pretty crappy solution to a very real problem. Mary wasn't the sort of woman that just accepted the "open the window and let the weather just blow all in your face" method of inclement weather driving, and made some sketches in her notebook. After she returned to her home in Alabama, she refined her idea into something remarkably like the modern windshield wiper. Her idea called for a rubber blade, held to a vehicle's window by an arm, under a bit of pressure to keep the blade's contact with the window surface via a spring. The arm, which would pivot at a point above the window, would be operated via crank from inside the vehicle, allowing the driver to pivot the blade, sweeping an arc across the window of rain and sleet and snow and horse-waste-free glass. "... to provide a device operating on the outside of the glass to remove snow, rain, or sleet from the center vestibule-window of modern electric motor cars..."
For some reason, she only specifically specified electric motor cars, even though her device was clearly applicable to any vehicle. It's a telling hint about the landscape of the automotive world of the turn of the 20th century, and how gasoline-powered cars were by no means the default type of car just yet. "we do not consider it to be of such commercial value as would warrant our undertaking its sale." ... which has to be one of the worst decisions in all of automobile engineering. 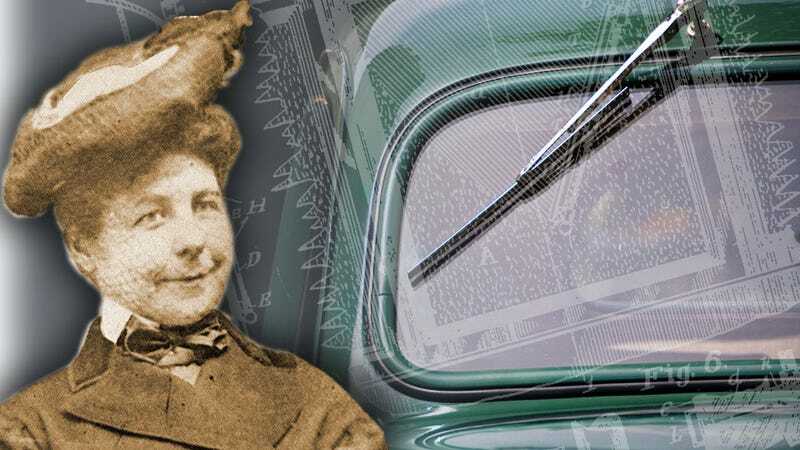 By 1920, her patent had expired, and the automobile industry was expanding greatly, producing millions of cars with windshield wipers that used Anderson's fundamental design and principle. Marge: "Well, a woman also invented the windshield wiper!" So, at least that's something? Maybe to help right this wrong, we can start calling windshield wipers "Marywipes" or something like that.